1. MyStartupStory My name is Anthony M. Grimaldi of JourneyManDesigns: Illustrator & Graphic Designer from New York City. In 2000, I decided to pursue an artistic career more determinedly and purposefully, so I attended the Katherine Gibbs School and acquired an Associate’s Degree in Visual Communications. 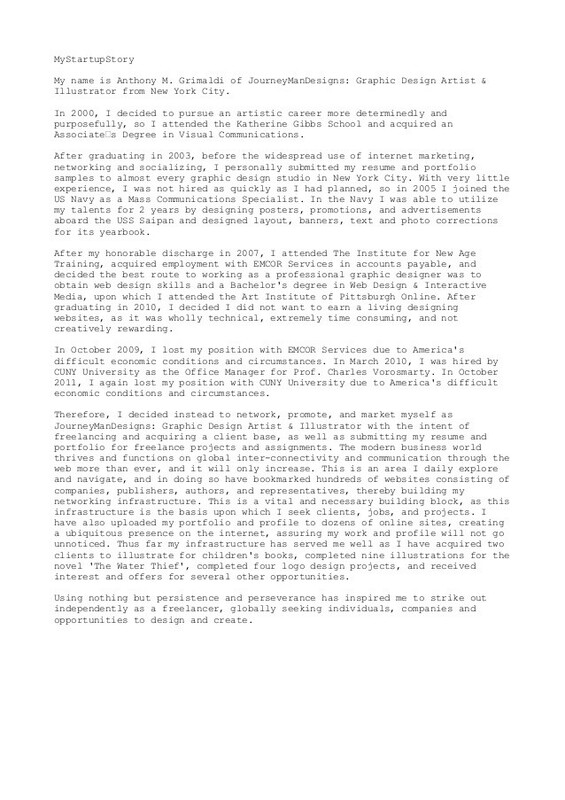 After graduating in 2003, before the widespread use of internet marketing, networking and socializing, I personally submitted my resume and portfolio samples to almost every graphic design studio in New York City. With very little experience, I was not hired as quickly as I had planned, so in 2005 I joined the US Navy as a Mass Communications Specialist. In the Navy I was able to utilize my talents for 2 years by designing posters, promotions, and advertisements aboard the USS Saipan and designed layout, banners, text and photo corrections for its yearbook. After my honorable discharge in 2007, I attended The Institute for New Age Training, acquired employment with EMCOR Services in accounts payable, and decided the best route to working as a professional graphic designer was to obtain web design skills and a Bachelor’s degree in Web Design & Interactive Media, upon which I attended the Art Institute of Pittsburgh Online. After graduating in 2010, I decided I did not want to earn a living designing websites, as it was wholly technical, extremely time consuming, and not creatively rewarding. In October 2009, I lost my position with EMCOR Services due to America’s difficult economic conditions and circumstances. In March 2010, I was hired by CUNY University as the Office Manager for Prof. Charles Vorosmarty. In October 2011, I again lost my position with CUNY University due to America’s difficult economic conditions and circumstances. 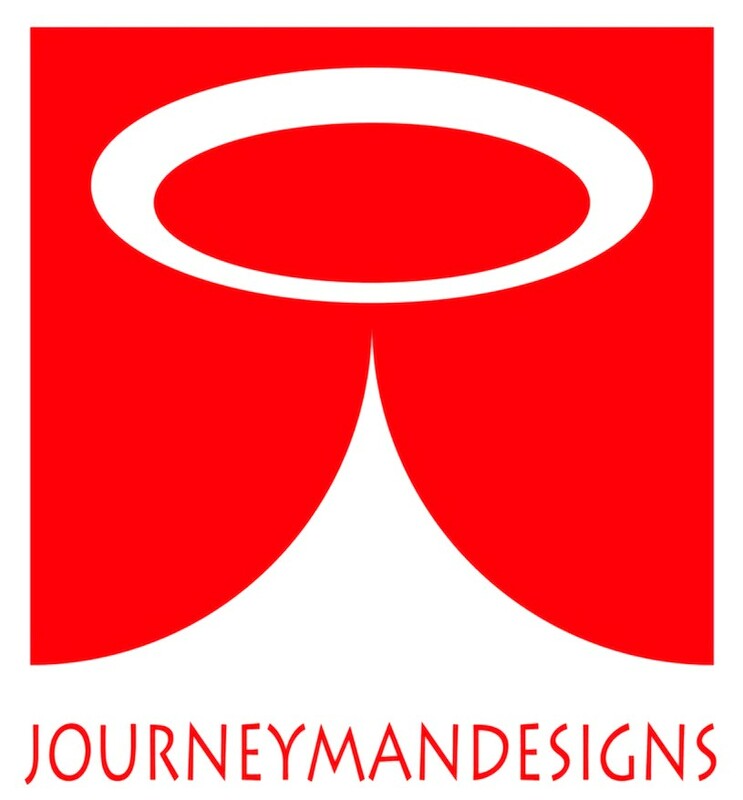 Therefore, I decided instead to network, promote, and market myself as JourneyManDesigns: Illustrator & Graphic Designer with the intent of freelancing and acquiring a client base, as well as submitting my resume and portfolio for freelance projects and assignments. The modern business world thrives and functions on global inter-connectivity and communication through the web more than ever, and it will only increase. This is an area I daily explore and navigate, and in doing so have bookmarked hundreds of websites consisting of companies, publishers, authors, and representatives, thereby building my networking infrastructure. This is a vital and necessary building block, as this infrastructure is the basis upon which I seek clients, jobs, and projects. I have also uploaded my portfolio and profile to dozens of online sites, creating a ubiquitous presence on the internet, assuring my work and profile will not go unnoticed. Thus far my infrastructure has served me well as I have acquired clients to illustrate for children’s books, and received projects, interest and offers for several other opportunities. Using nothing but persistence and perseverance has inspired me to strike out independently as a freelancer, globally seeking individuals, companies and opportunities to design and create.